Give me a hot slice of pizza and a fancy-pants beer for around $7.00 and I'm happy. Add to that a really cool atmosphere and a nice warm vibe from everyone in the place, and I'm truly content. Then add a pepperoni roll. East Glisan Pizza Lounge accomplished all of the above when Fooditka and I stopped in last week; part of our continuing effort to eat our way through the thrifty and delicious cornucopia that is Portland during happy hour. It's a bit farther away from our neighborhood than the places we've been so far, but overall, it was well worth the few extra minutes in the car. Upon entering the space feels warm and comfortable, dimly lit but not overly dark, and there is plenty of room to find a table or sit at the bar. Interesting artwork and colorful menu boards help liven things up, and I'm pretty sure David Bowie Radio was playing on Pandora. 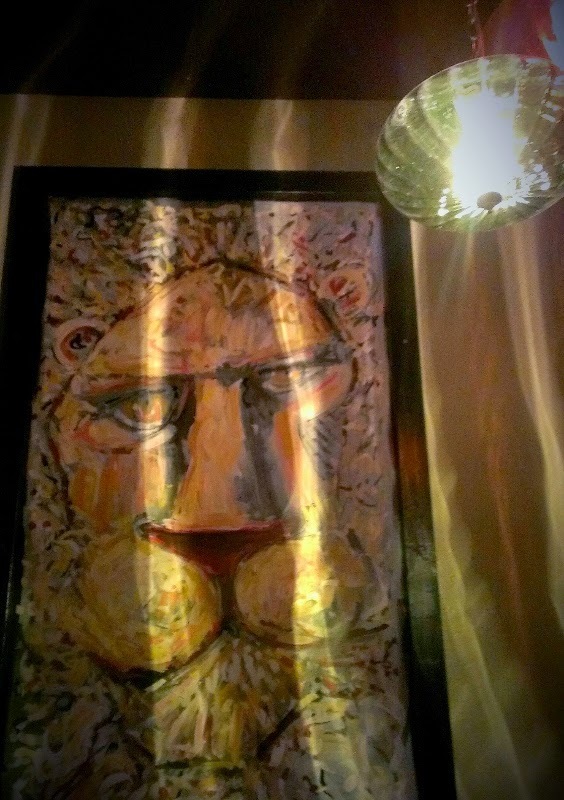 A giant mural of a lion watched over us as we ate. It's that kind of place. As we were there for happy hour, our options were somewhat limited, but they have a pretty decent full size menu with appetizers and some salads to go along with all the pizza options. They actually have two happy hours, early from 4 p.m. to 6 p.m., and late from 10 p.m. to midnight. The early deal includes a $2.00 slice of the day, 2 pepperoni rolls for $3.00, and $1.00 off drafts, well drinks, and house wines. The late happy hour includes $1.00 New York slices and the same 2 pepperoni rolls for $3.00. Pizza - We were there for the early happy hour, so we each got a slice of the day. I got the meat slice, and Fooditka got the veggie. Her's was a white slice with caramelized onions and potatoes, and mine was more traditional looking with red sauce and bacon. Both were very good, more of a New York style slice than a Neapolitan, and well cooked. They were a little on the small side, and on their own wouldn't have been quite enough. Fortunately we also got a pair of pepperoni rolls. Pepperoni Rolls - These were good, but not great. They definitely helped fill me up, and the pepperoni and cheese were delightful, but I thought the doughy outside was slightly under-cooked. They came with a little cup of sauce to dip in, but I thought the sauce was a little bland. All that said, I ate my roll and half of Fooditka's. So, you know, still pretty good. Beer - They have a rotating selection of several different craft beers, all of which are good depending on your preference. I can't remember exactly what I got, maybe it was a Breakside Pale Ale of some kind. Anyway, it's a lot of local crafty stuff that a beer drinker would enjoy. Our waitress was very nice and friendly, just like pretty much everywhere else I've eaten since we've moved out here. She patiently explained the happy hour caveat, that the food specials are only valid if you also get a beverage. It doesn't need to be alcoholic, and they have a variety of fancy sodas that all sounded interesting as well.